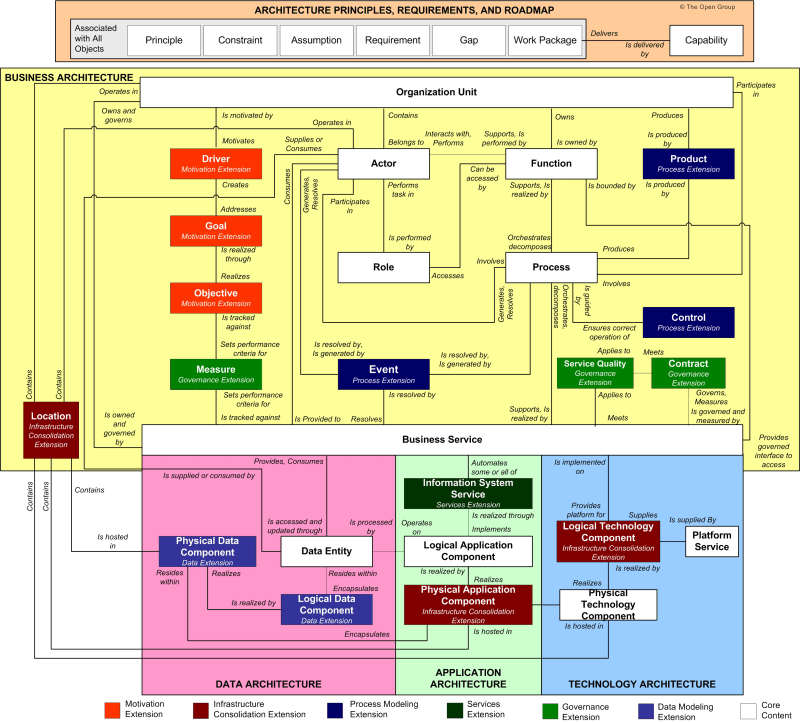 Overview of the TOGAF content metamodel (see 34.2.2 Overview of the Content Metamodel) provides a high-level overview of the content of the metamodel. Core and Extension Content provides an introduction to the way in which TOGAF employs a basic core metamodel and then applies a number of extension modules to address specific architectural issues in more detail. Core Metamodel Entities introduces the core TOGAF metamodel entities, showing the purpose of each entity and the key relationships that support architectural traceability. Catalog, Matrix, and Diagram Concept describes the concept of catalogs, matrices, and diagrams. The role of TOGAF is to provide an open standard for architecture that is applicable in many scenarios and situations. In order to meet this vision, it is necessary to provide a fully featured enterprise architecture metamodel for content and also to provide the ability to avoid carrying out unnecessary activities by supporting tailoring. The core TOGAF content metamodel and its extensions are illustrated in Figure 34-1. Actor: A person, organization, or system that is outside the consideration of the architecture model, but interacts with it. Application Component: An encapsulation of application functionality that is aligned to implementation structuring. Business Service: Supports business capabilities through an explicitly defined interface and is explicitly governed by an organization. Data Entity: An encapsulation of data that is recognized by a business domain expert as a discrete concept. Data entities can be tied to applications, repositories, and services and may be structured according to implementation considerations. Function: Delivers business capabilities closely aligned to an organization, but not explicitly governed by the organization. Information System Service: The automated elements of a business service. An information system service may deliver or support part or all of one or more business services. Organization Unit: A self-contained unit of resources with goals, objectives, and measures. Organization units may include external parties and business partner organizations. Platform Service: A technical capability required to provide enabling infrastructure that supports the delivery of applications. Role: An actor assumes a role to perform a task. Technology Component: An encapsulation of technology infrastructure that represents a class of technology product or specific technology product. A more in-depth definition of terms used within the content metamodel can be found in Part I, 3. Definitions. A business service operates as a boundary for one or more functions. The granularity of business services is dependent on the focus and emphasis of the business (as reflected by its drivers, goals, and objectives). 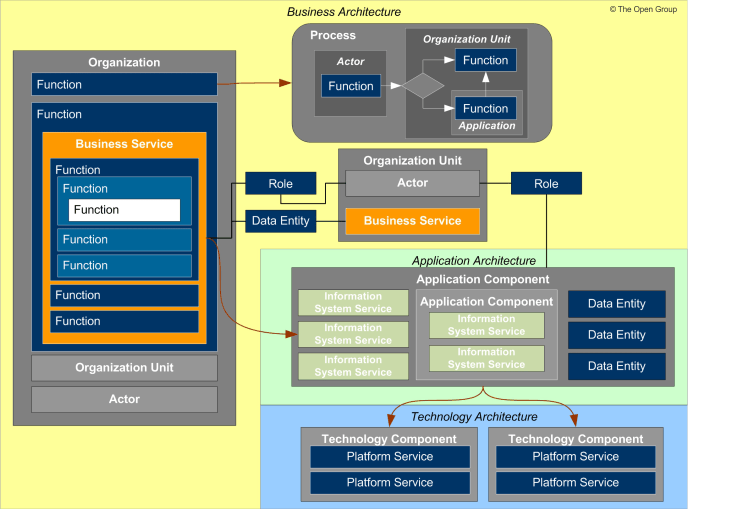 A service in Service Oriented Architecture (SOA) terminology (i.e., a deployable unit of application functionality) is actually much closer to an application service, application component, or technology component, which may implement or support a business service. Business services may be realized by business activity that does not relate to IT, or may be supported by IT. Business services that are supported by IT are deployed onto application components. Application components can be hierarchically decomposed and may support one or more business services. It is possible for a business service to be supported by multiple application components, but this is problematic from a governance standpoint and is symptomatic of business services that are too coarse-grained, or application components that are too fine-grained. An application component is implemented by a suite of technology components. For example, an application, such as "HR System" would typically be implemented on several technology components, including hardware, application server software, and application services. Figure 34-2 illustrates the core entities and their relationships. 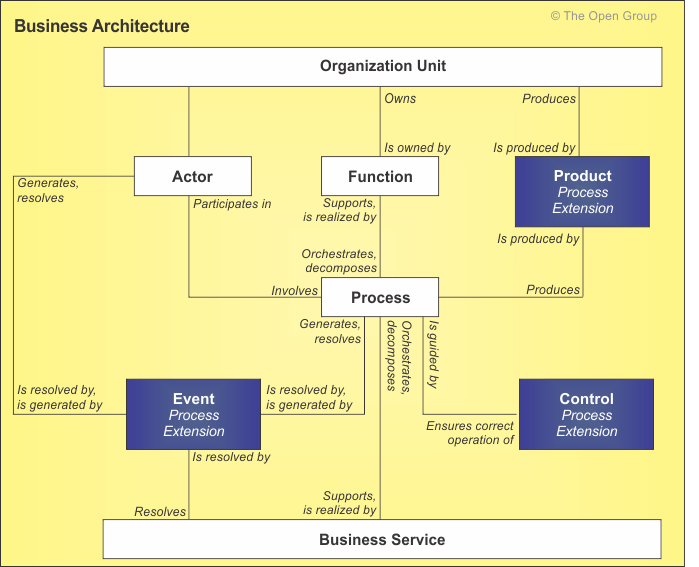 The content metamodel is used as a technique to structure architectural information in an ordered way so that it can be processed to meet the stakeholder needs. The majority of architecture stakeholders do not actually need to know what the architecture metamodel is and are only concerned with specific issues, such as "what functionality does this application support? ", "which processes will be impacted by this project? ", etc. In order to meet the needs of these stakeholders, the TOGAF concepts of building blocks, catalogs, matrices, and diagrams are used. Building blocks are entities of a particular type within the metamodel (for example, a business service called "Purchase Order"). Building blocks carry metadata according to the metamodel, which supports query and analysis. For example, business services have a metadata attribute for owner, which allows a stakeholder to query all business services owned by a particular organization. Building blocks may also include dependent or contained entities as appropriate to the context of the architecture (for example, a business service called "Purchase Order" may implicitly include a number of processes, data entities, application components, etc.). Catalogs are lists of building blocks of a specific type, or of related types, that are used for governance or reference purposes (for example, an organization chart, showing locations and actors). As with building blocks, catalogs carry metadata according to the metamodel, which supports query and analysis. Matrices are grids that show relationships between two or more model entities. Matrices are used to represent relationships that are list-based rather than graphical in their usage (for example, a CRUD matrix showing which applications Create, Read, Update, and Delete a particular type of data is difficult to represent visually). Diagrams are renderings of architectural content in a graphical format to allow stakeholders to retrieve the required information. Diagrams can also be used as a technique for graphically populating architecture content or for checking the completeness of information that has been collected. TOGAF defines a set of architecture diagrams to be created (e.g., organization chart). Each of these diagrams may be created several times for an architecture with different style or content coverage to suit stakeholder concerns. Building blocks, catalogs, matrices, and diagrams are all concepts that are well supported by leading enterprise architecture tools. In environments where tools are used to model the architecture, such tools typically support mechanisms to search, filter, and query the Architecture Repository. On-demand querying of the Architecture Repository (such as the business service ownership example mentioned above) can be used to generate ad hoc catalogs, matrices, and diagrams of the architecture. As this type of query is by nature required to be flexible, it is therefore not restricted or defined within the content metamodel. The interactions between metamodel, building blocks, diagrams, and stakeholders are shown in Figure 34-3. At the highest level, the content framework is divided up in line with the TOGAF ADM phases, as shown in Figure 34-4. 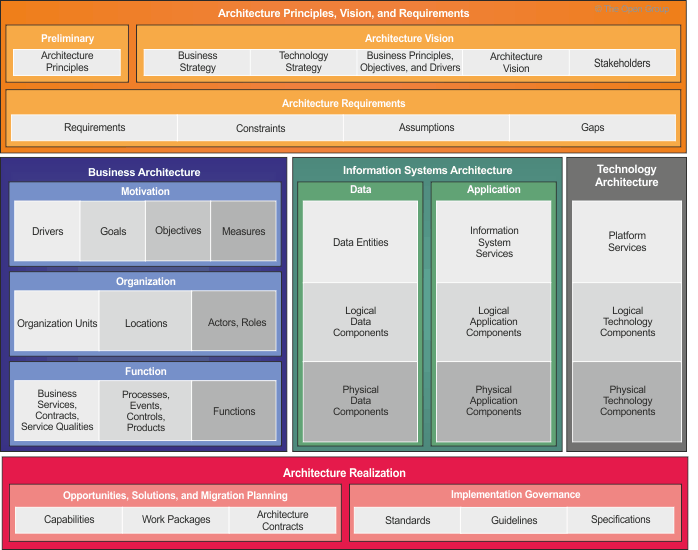 Architecture Principles, Vision, and Requirements artifacts are intended to capture the surrounding context of formal architecture models, including general architecture principles, strategic context that forms input for architecture modeling, and requirements generated from the architecture. The architecture context is typically collected in the Preliminary and Architecture Vision phases. 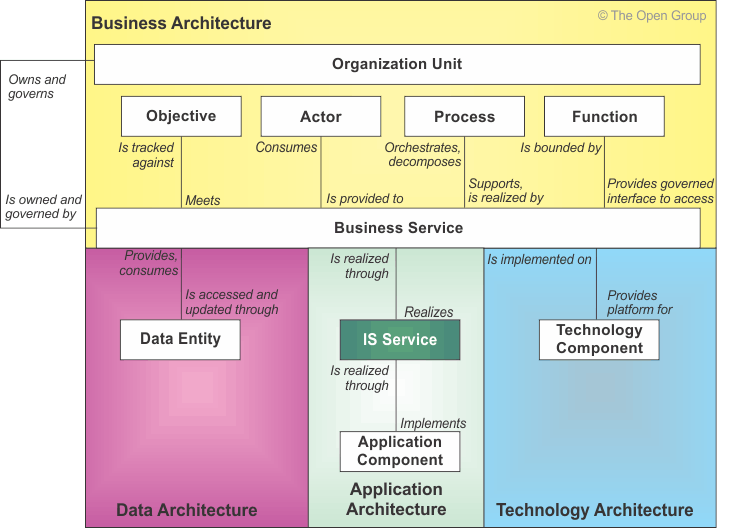 Business Architecture artifacts capture architectural models of business operation, looking specifically at factors that motivate the enterprise, how the enterprise is organizationally structured, and also what functional capabilities the enterprise has. 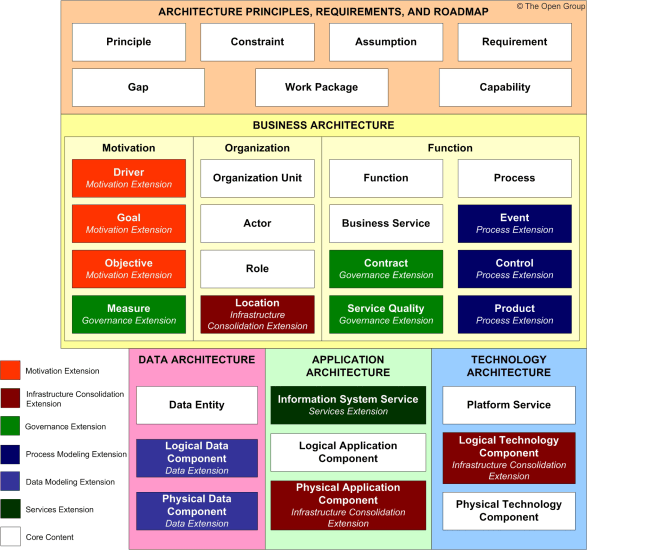 Information Systems Architecture artifacts capture architecture models of IT systems, looking at applications and data in line with the TOGAF ADM phases. Technology Architecture artifacts capture procured technology assets that are used to implement and realize information system solutions. Architecture Realization artifacts capture change roadmaps showing transition between architecture states and binding statements that are used to steer and govern an implementation of the architecture. A more detailed representation of the content metamodel is shown in Figure 34-5. Core Content Metamodel (see 34.3.1 Core Content Metamodel) describes the metamodel entities that form the core content metamodel. Core Architecture Artifacts (see 34.3.2 Core Architecture Artifacts) lists the set of artifacts intended to accompany the core content metamodel. Full Content Metamodel (see 34.3.3 Full Content Metamodel) describes the metamodel entities that form extensions to the content metamodel. Figure 34-6 shows the metamodel entities and relationships that are present within the core content metamodel. 35. 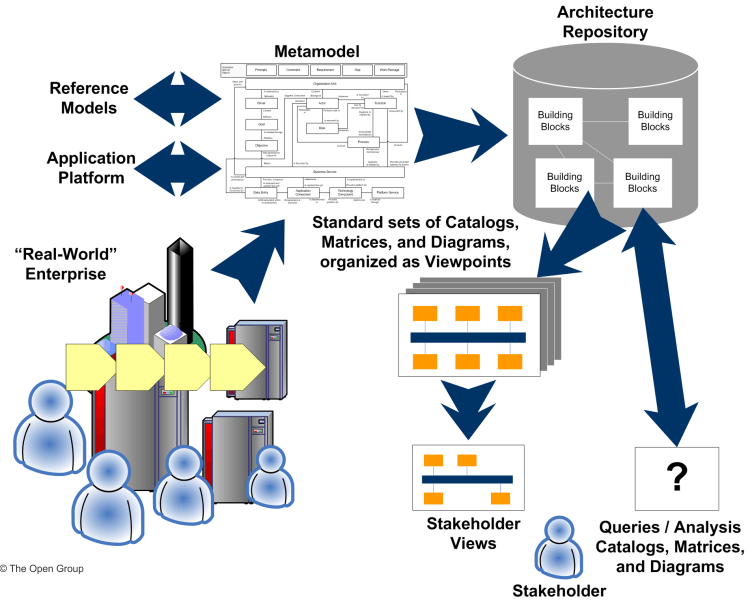 Architectural Artifacts discusses in detail the way in which the underlying content metamodel can be used to present a set of catalogs, matrices, and diagrams to address stakeholder concerns. When all extensions are applied to the core content metamodel, a number of new metamodel entities are introduced. Figure 34-7 shows which entities are contained in the core content metamodel and which new entities are introduced by which extension. The relationships between entities in the full metamodel are shown in Figure 34-8. As discussed earlier, the TOGAF content metamodel supports a number of extension modules that allow more in-depth consideration for particular architecture concerns. Figure 34-9 shows the core content metamodel and predefined extension modules. During the Architecture Vision phase of a particular engagement, the scope of the engagement will be used to make a determination on appropriate extensions to be employed in order to adequately address the architecture requirements. For example, the scope of an engagement could be defined as core content, plus the governance extensions, as shown in Figure 34-10. Changes to the metamodel entities and relationships are shown in Figure 34-11. Measure is added as a new entity that links objective and business service. Service Quality is added as a new entity that provides a generic service profile template to be applied to business services or contracts. Contract is added as a new entity that formalizes the functional and non-functional characteristics of a service interaction with other services, external applications, or users. The services extension is intended to allow more sophisticated modeling of the service portfolio by creating a concept of IS services in addition to the core concept of business services. IS services are directly supported by applications and creating the layer of abstraction relaxes the constraints on business services while simultaneously allowing technical stakeholders to put more formality into an IS service catalog. 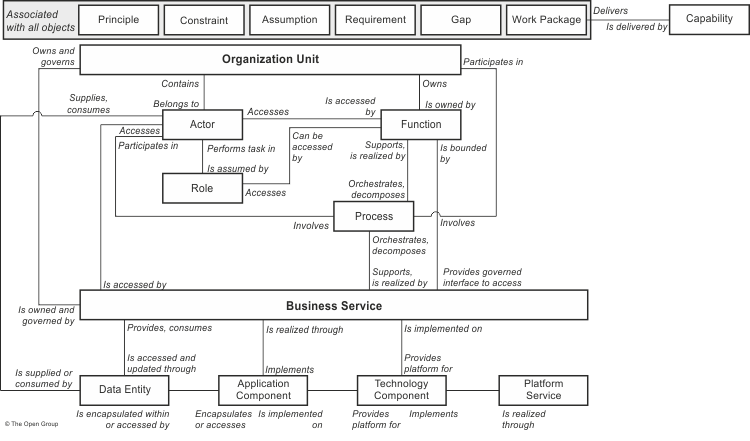 Business services can be defined outside of the constraints that exist in the core metamodel. This allows for a more natural engagement with business stakeholders. IS services can be defined according to a model that maps closely to implementation, providing a more realistic solution abstraction to support IT decision-making. Business and IS service relationships show where the business view aligns with the IS view and where there are misalignments. Changes to the metamodel entities and relationships are shown in Figure 34-12. 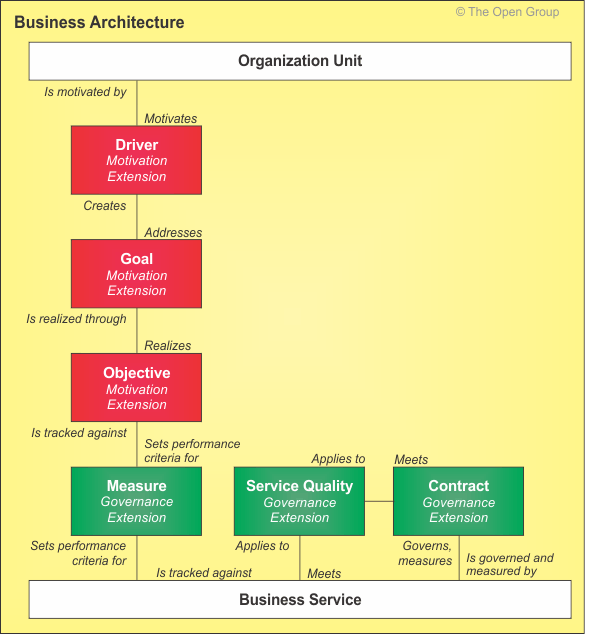 IS Service is added as a new metamodel entity, extending business service. IS Service inherits all the relationships of a business service. A new relationship is created linking an IS service to a business service. IS Service is added as a new type of business service. This extension allows detailed process modeling and the cataloging of process artifacts. May be used to support regulatory compliance activities. May be used to re-purpose legacy or non-architectural process decomposition analysis. Changes to the metamodel entities and relationships are shown in Figure 34-13. Control is added as a metamodel entity, relating to a Process. Product is added as a metamodel entity, linking Organization and Processes. Attributes are added for the new metamodel entities of Event, Control, and Product. The structure of data is modeled independently from its location, allowing data models to be developed that span multiple systems without being tied to physical concerns. Logical groupings of data can be used to set governance, security, or deployment boundaries around data, providing a much more holistic appreciation of data issues surrounding the architecture. Changes to the metamodel entities and relationships are shown in Figure 34-14. 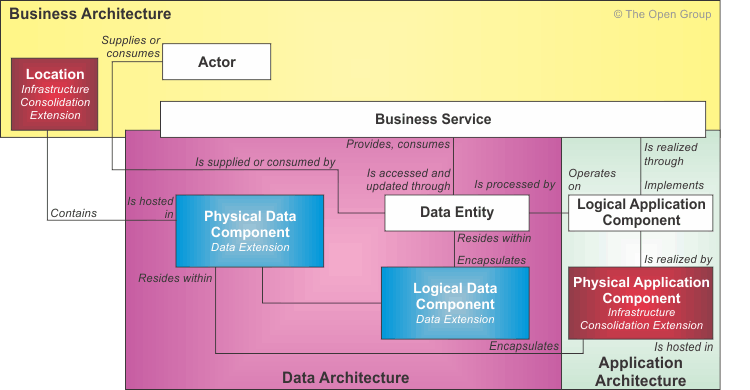 Logical Data Component is added as a new metamodel entity, encapsulating data entities. Physical Data Component is added as a new metamodel entity, extending Logical Data Component. A relationship is created between Physical Data Component and Application Component. If the infrastructure consolidation extension is applied, this should be to Physical Application Component. If the infrastructure consolidation extension is applied, Physical Data Components will have a relationship with Location. Attributes are added for the new metamodel entities of Logical Data Component and Physical Data Component. Changes to the metamodel entities and relationships are shown in Figure 34-15. Location attributes on Organization, Actor, Application Component, Data Component, and Technology Component are enhanced to create a location entity within the metamodel. Application Components are extended to include Logical Application Components (a class of application) and Physical Application Components (an actual application). Technology Components are extended to include Logical Technology Components (a class of technology product) and Physical Technology Components (an actual technology product). Changes to the metamodel entities and relationships are shown in Figure 34-16. Driver, Goal, and Objective are added as new entities that link Organization Unit to Business Service. Attributes are added for the new metamodel entities of Driver, Goal, and Objective. Gap analysis is described in Part III, 27. Gap Analysis. A sample set of architecture principles is defined in Part III, 23. Architecture Principles. Logical Technology Components are categorized according to the TOGAF TRM, which may be extended to meet the needs of an individual organization. Physical Technology Components are categorized according to the TOGAF TRM, which may be extended to meet the needs of an individual organization. Platform Services are categorized according to the TOGAF TRM, which may be extended to meet the needs of an individual organization.